After an unusually warm March and cool April here in southeastern Pennsylvania, things are pretty much back to normal as far as bloom times. And per the usual spring palette, there’s a whole lot of pink, blue, yellow, and white going on. They’re not my favorite colors, especially on sunny days, but they’re rather nice on cloudy days (which we’ve been having a lot of), or early in the morning. 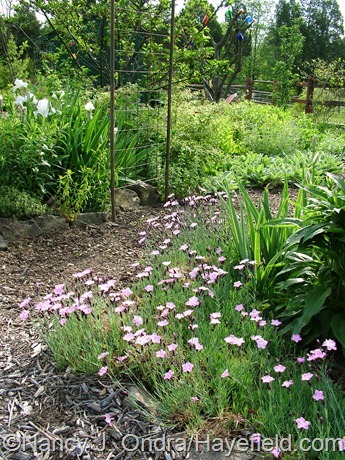 Among the pinks are, well, pinks (Dianthus), such as ‘Bath’s Pink’ (above). 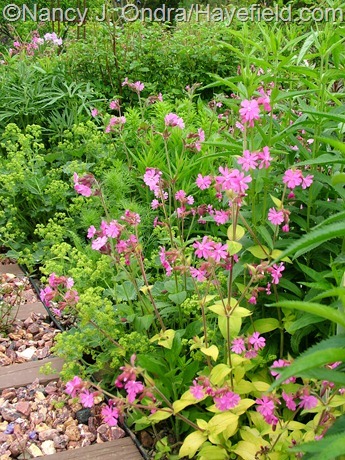 Below is a much stronger pink color, in ‘Ray’s Golden Campion’ (Silene dioica). 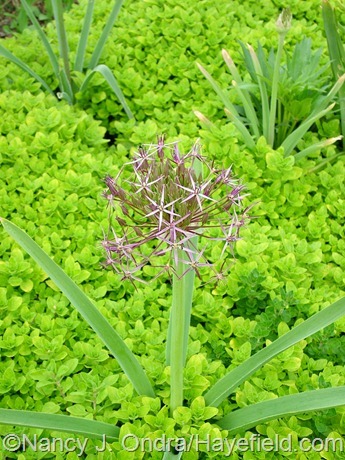 Above, common chives (Allium schoenoprasum); below, leather flower (Clematis glaucophylla). Above, ‘Apart’ rugosa rose (Rosa rugosa); below, ‘Amazone’ tuberous Jerusalem sage (Phlomis tuberosa). 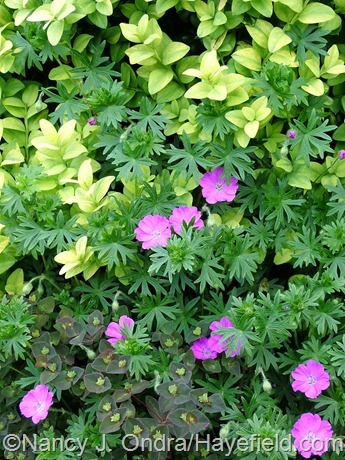 Above, ‘New Hampshire Purple’ bloody cranesbill (Geranium sanguineum) weaving up through the new shoots of ‘Latifolia Maculata’ boxwood (Buxus sempervirens), with a bit of Euphorbia dulcis ‘Chameleon’. 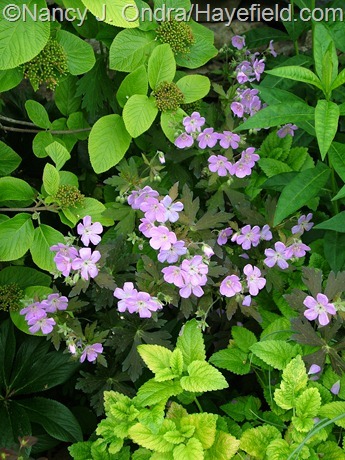 Below is ‘Espresso’ wild geranium (Geranium maculatum) with golden wayfaring tree (Viburnum lantana ‘Aureum’) and ‘All Gold’ lemon balm (Melissa officinalis). Both of these geraniums look pink in these pictures, but they’re a bit more on the purple side in real life. 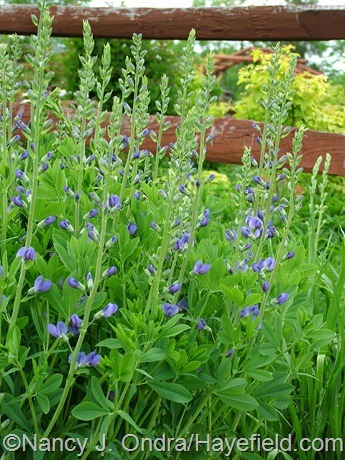 …and above, ordinary blue false indigo (Baptisia australis). 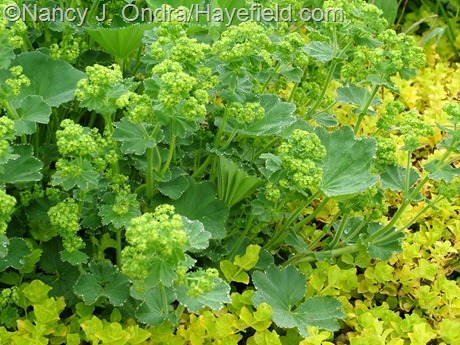 Above, lady’s mantle (Alchemilla mollis) with golden creeping Jenny (Lysimachia nummularia ‘Aurea’). 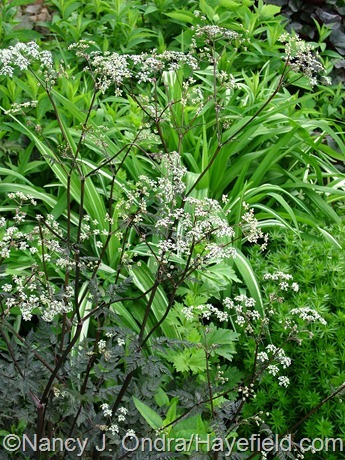 Below, ‘Ravenswing’ wild chervil (Anthriscus sylvestris). 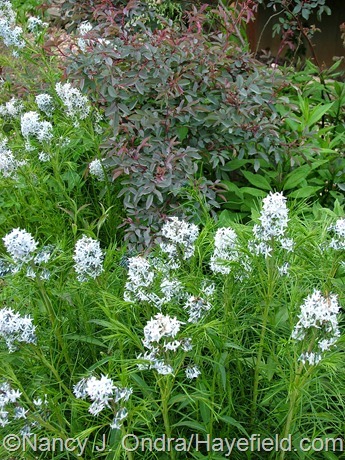 Above, ‘Onondaga’ viburnum (Viburnum sargentii); below, ‘Striata’ (‘Grace Barker’) Solomon’s seal (Polygonatum x hybridum). 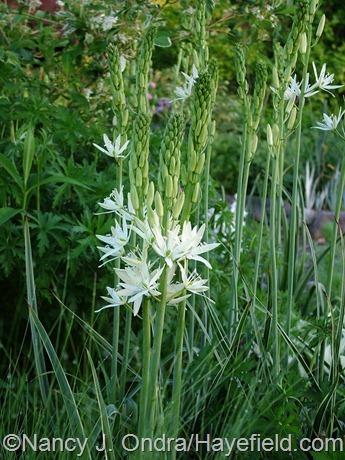 Above, ‘Sacajawea’ camassia (Camassia leichtlinii); below, white Spanish bluebell (Hyacinthoides hispanica ‘Alba’). 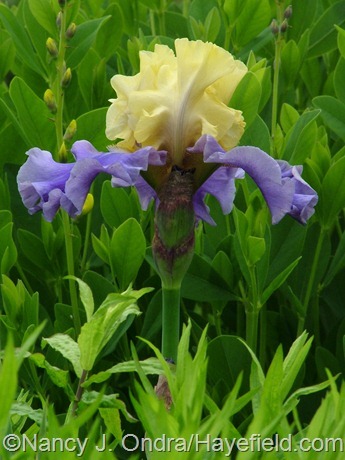 …and ‘Rendezvous’ Dutch iris (below). 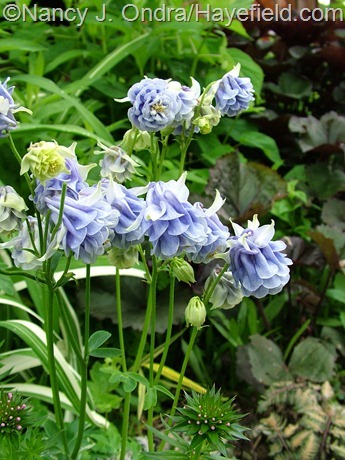 May is also prime time for columbines (Aquilegia). 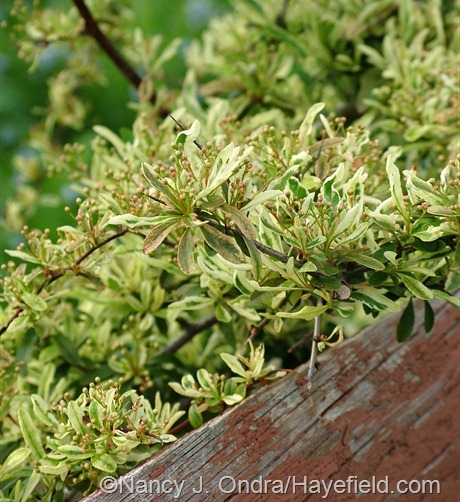 Above is ‘Black Barlow’ with Abelia mosanensis. Above and below are two ridiculously frilly flower forms that came from ‘Touchwood Supreme Mix’ seeds. 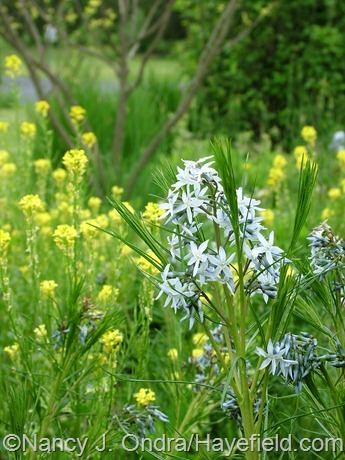 Some clumps of Arkansas bluestar (Amsonia hubrichtii) are just coming into bloom, while others are nearly past. Above, it’s with blue-leaved rose (Rosa glauca); below, it’s with ‘Winter Cream’ winter cress (Barbarea vulgaris). 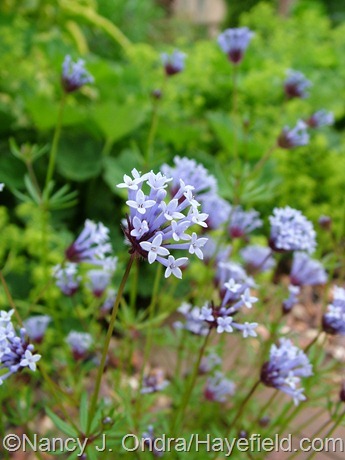 Below is blue woodruff (Asperula orientalis), an early-blooming annual that has a somewhat amsonia-like effect, but on a much smaller scale. 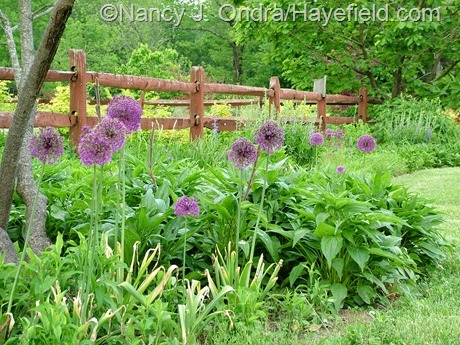 May is a great time for ornamental onions (Allium), too, though the spectacular show I enjoyed last May is much less spectacular this year. 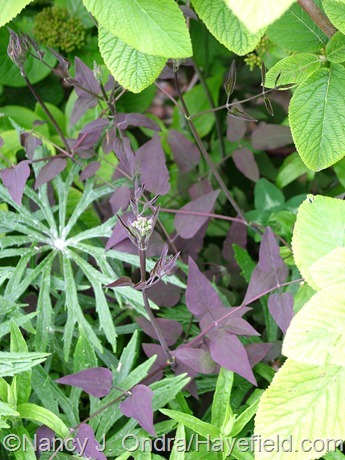 Still, some came back and look good, including ‘Purple Sensation’ above and star-of-Persia (A. christophii), with golden oregano (Origanum vulgare ‘Aureum’) below. 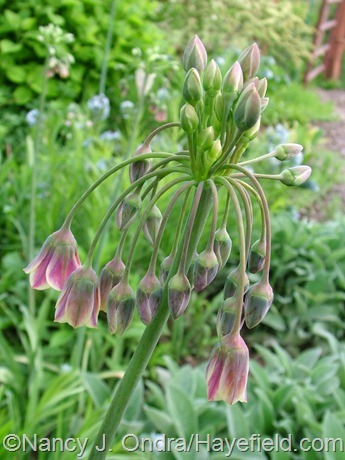 Sicilian honey garlic (above) used to be classified as a species of allium, but now it’s usually sold as Nectaroscordum siculum var. bulgaricum. 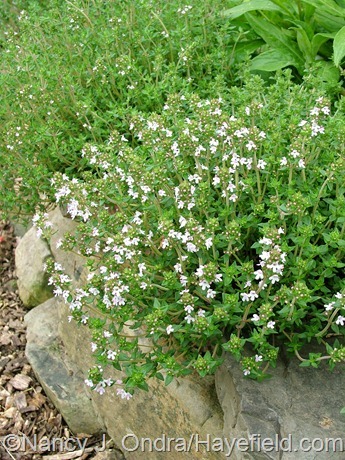 Above, common thyme (Thymus vulgaris), and below, ‘Black Sprite’ mountain bluet (Centaurea montana) growing close by. 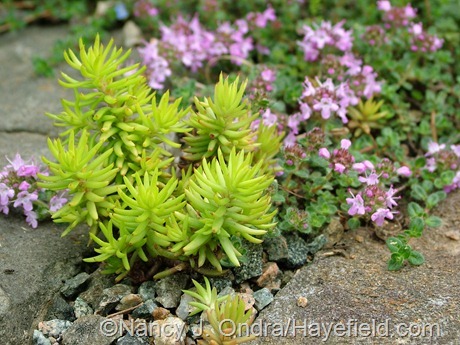 Now, to celebrate Foliage Follow-Up a day early, here are some lovely leaves, starting with a seedling (one of many) of Sedum rupestre ‘Angelina’, paired with creeping thyme (Thymus serpyllum). 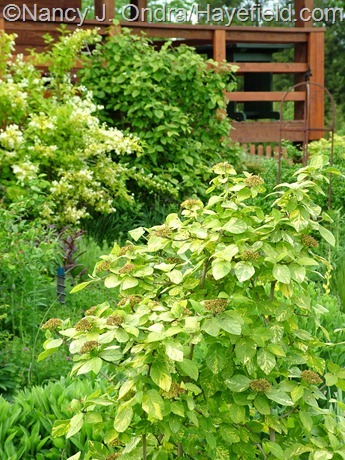 Above is ‘Little Honey’ oakleaf hydrangea (Hydrangea quercifolia) against the near-black lace of Anthriscus sylvestris ‘Ravenswing’. 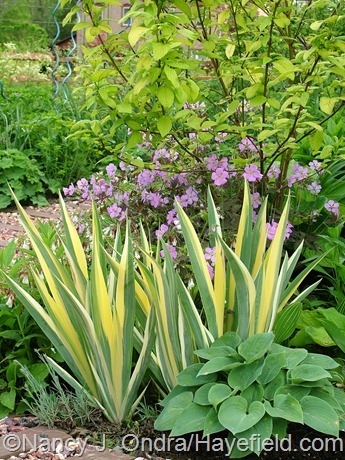 Below is variegated sweet iris (Iris pallida ‘Variegata’) paired with ‘Blue Cadet’ hosta, ‘Espresso’ wild geranium, and ‘Sunshine’ red-twig dogwood (Cornus sericea subsp. occidentalis). 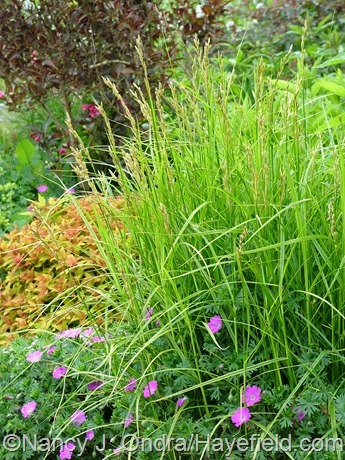 Above, ‘Oehme’ palm sedge (Carex muskingumensis) is in front of ‘Latifolia Maculata’ boxwood; below, it’s mingling with ‘New Hampshire Purple’ bloody cranesbill. 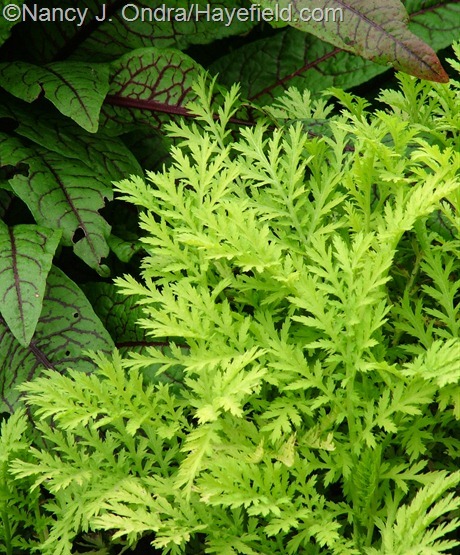 Some splendid yellows include golden meadowsweet (Filipendula ulmaria ‘Aurea’) above and ‘Isla Gold’ tansy (Tanacetum vulgare) below. Above is bloody dock (Rumex sanguineus); below is ‘Red Majestic’ contorted hazel (Corylus avellana). 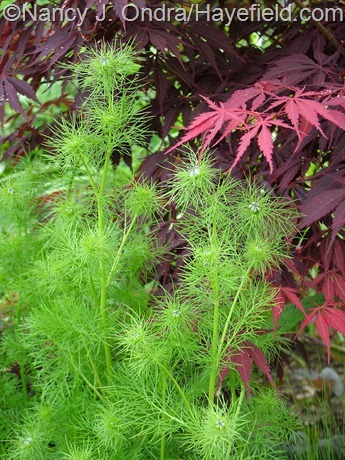 Above is an unknown Japanese maple (Acer palmatum) with bright green love-in-a-mist leaves (Nigella damascena); below is dark-leaved Serious Black clematis (Clematis recta ‘Lime Close’). Oh my, orange! 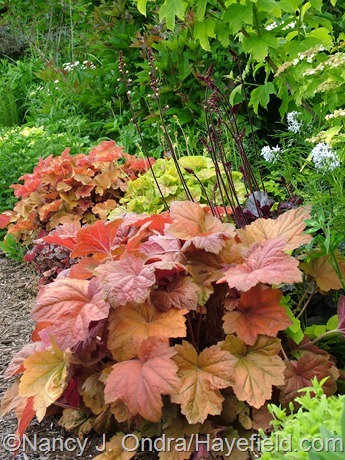 Above is ‘Southern Comfort’ heuchera; below is ‘Caramel’ (against ‘Tiramisu’). Above, tiny Sedum stefco; below, the eventually-tree-size (if the deer stop eating it) rosemary willow (Salix elaeagnos subsp. 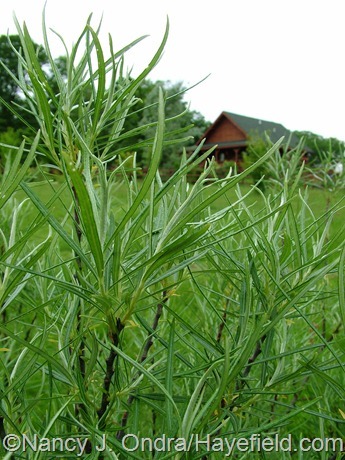 angustifolia). 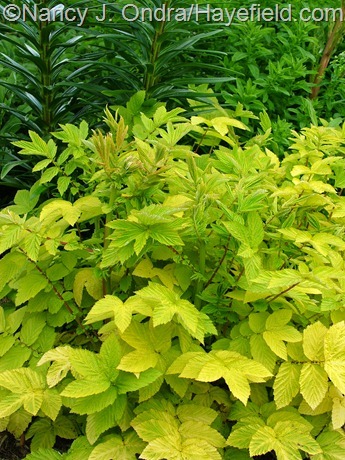 Above, golden wayfaring tree (Viburnum lantana ‘Aureum’) between Euphorbia palustris ‘Zauberflote’ and golden mockorange (Philadelphus coronarius); below, variegated wayfaring tree (V. lantana ‘Variegatum’). Above, ‘Harlequin’ firethorn (Pyracantha). Below, for those of you who admired the creamy white foliage of ‘Mostly Ghostly’ hosta last month, the reality of how it looks a month later. And to finish, a bunch of general garden shots. Above and below are opposite views of the foundation borders on the side of the house. Above is a view of the front garden from the side. 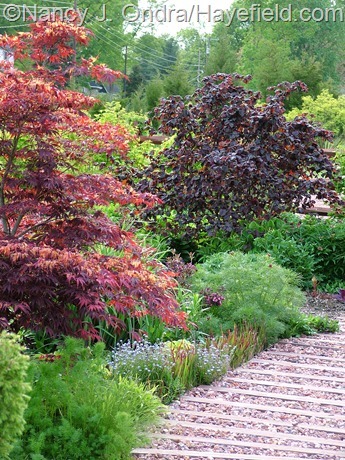 The no-name, red-leaved Japanese maple in the center is the same one that appears in the next three shots, from different angles. From inside the fence, it’s obvious that the front garden still needs work, but from outside, it looks lush and full already. And one more shot, of the side gate and silver willow (Salix alba var. sericea). Well, that was a fun look back through the last couple of weeks here at Hayefield. 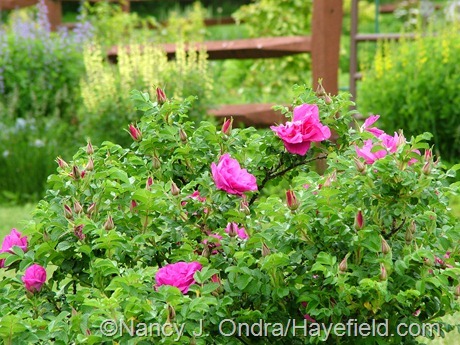 To see what’s springing up in other gardens all around the world, check out the list on links in Carol’s main Bloom Day post at May Dreams Gardens. 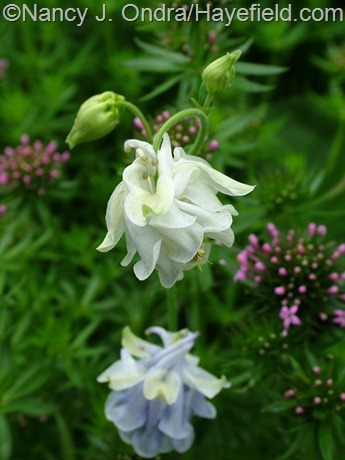 What are the pink buds behind the second photo of Touchwood Supreme Aquilegia? Your photos brighten another rainy morning here! Thank you. That’s crosswort (Phuopsis stylosa), Alice. Thanks for visiting! Love it. Any thoughts on sources for plants or seeds? If you like the buds, wait until you see it in full bloom! I found that a place called Dancing Oaks Nursery has it for sale here: http://www.dancingoaks.com/home/dok/page_743/phuopsis_stylosa.html. A warning, though, the foliage has a distinctly skunky odor if you step on it, and you occasionally get light whiffs of skunk even when the plant is undisturbed. I wouldn’t recommend putting it close to a house or a high-traffic path. 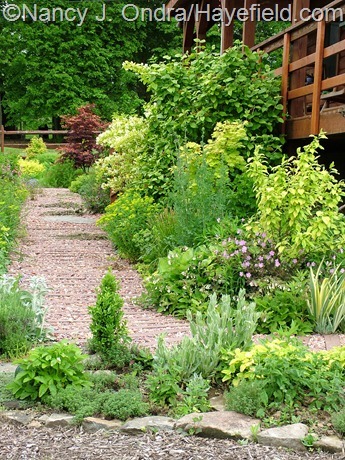 Visiting you garden is like entering into plant heaven, Nan, such diversity and such healthy specimens. It looks lovely. 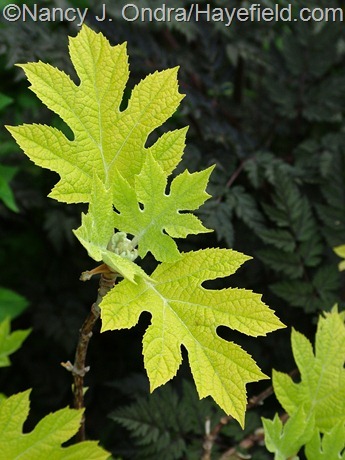 If there is a golden or variegated foliage in existence of any plant, you are growing it! Well done! That’s high praise coming from you, Frances, considering the beauty of your own garden. Thanks! Lovely as always! 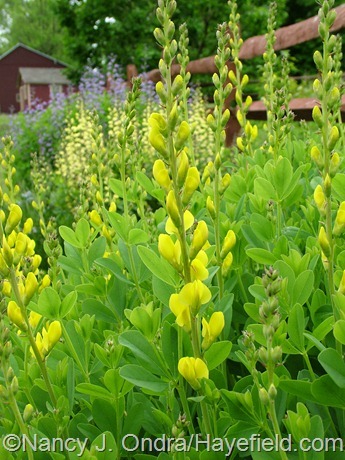 I just bought screaming yellow baptisia last year, but now I see your Carolina moonlight and I like that much better! Such a pleasing pale shade of yellow. 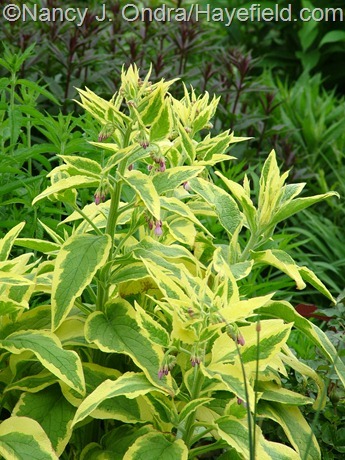 Also Axminster Gold’ Russian comfrey looks like a real sparkler – does it keep that gorgeous foliage all summer? Does it come true from seed? 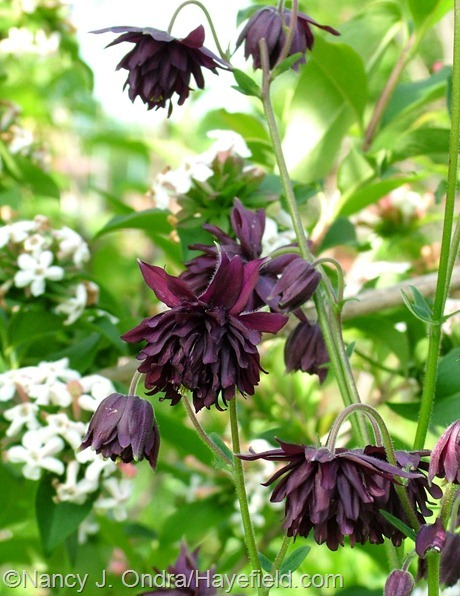 Serious Black clematis – I’ve never seen a dark leaved clematis, must add it to the list. Seriously, how many different plants do you grow? You have so many unusual wonders in your patch of Eden. 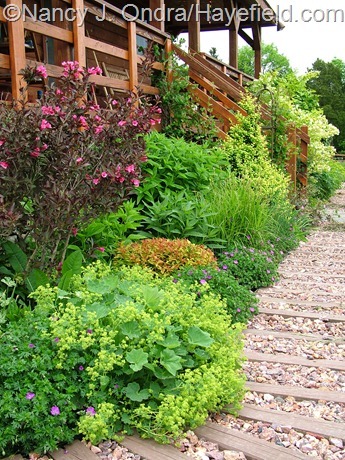 Fabulous garden! Each of those two yellow ones have its charms, Brenda, but I think ‘Screamin’ Yellow’ gets the nod for its splendid foliage and seedpods. You’d have room to grow a ‘Carolina Moonlight’ too, though, I think? The comfrey does look good all summer, as long as it gets some afternoon shade and/or doesn’t dry out too much. No, it doesn’t come true from seed, unfortunately. I should have mentioned that Serious Black is one of the bushy (not climbing) clematis. I need to move mine; as you can see, it’s getting nearly crowded out. Absolutely no idea how many plants are here; it changes daily, it seems! So happy to have a peek at your spring garden Nan. It’s looking so incredibly lush and healthy. 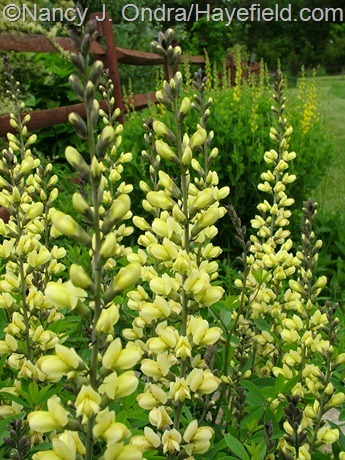 I love that baptisia ‘Carolina Moonlight’ with the dark grey stems against lemon flowers. 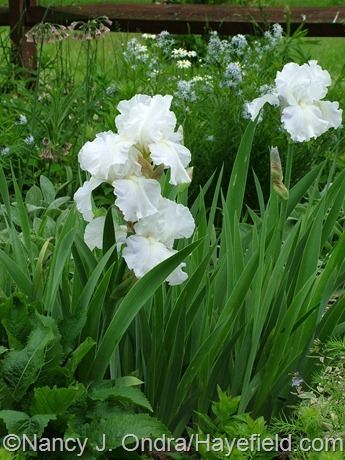 Also the pure white Iris is divine (I have been looking for a totally white Iris here for ages). 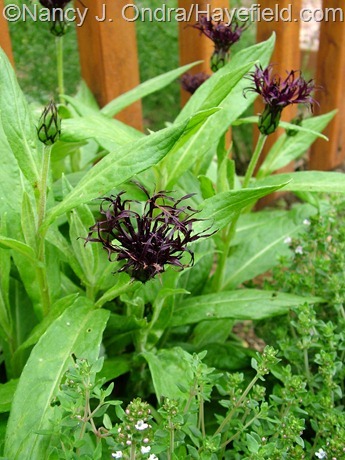 I’ve never heard of the black-leafed Clematis or ‘Black Sprite’ Centaurea – very unusual indeed. Can’t wait for the next instalment Nan! I hope you can find the white ‘Immortality’ iris someday, Kerry. 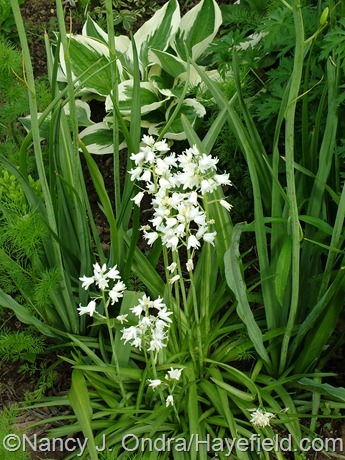 It’s a great increaser, and not only is it gorgeous now, but it’s also a reliable rebloomer in fall: a great bonus! Don’t know where to start or end..lol. the baptisas are great. I had the same problem, Greggo! Glad you like the baptisias; they’re getting better year by year. 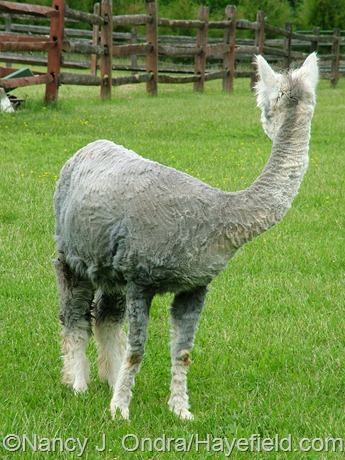 Apparently your alpaca is already wearing the summer suit! Poor Daniel looks terrible, I know. Shearing is an ordeal for all of us. Fortunately, their fleece always grows back! Oh, Alberto, you noticed! Poor Daniel (and Duncan, too). I need a very steady hand, and we all need a lot of patience, to get those parts done. I hope to get them completely “undressed” very soon! Thanks so much, Erica. Happy Bloom Day to you! Thank you for sharing your beautiful garden! Thank you for stopping by, Alexa. I hope you have a great day. Oh no! You have deer! 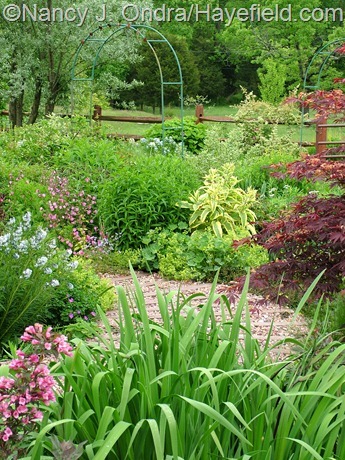 I don’t use any deer repellents because of the choice of plants in my unfenced gardens. 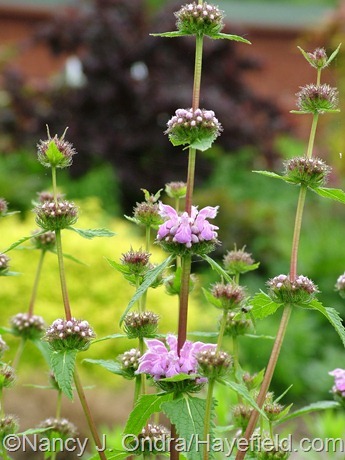 However, I use a rabbit repellent, I Must Garden, on young echinacea and geraniums. It works really well and truly lasts a long time without a bad smell and it’s organic and safe. I have no affiliation with the company, I have just had good success with it and they also make a deer repellent. I’m intrigued by the Russian Comfrey. I saw that recently at a greenhouse and thought about it since I’m trying to add bigger leaves and some variegated foliage in certain places. 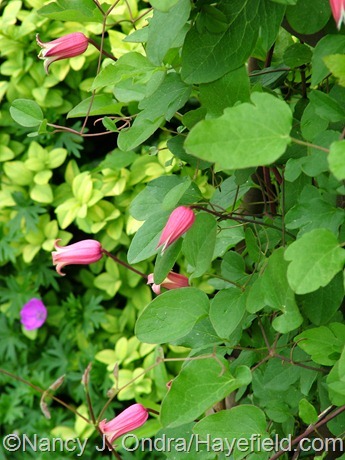 Do you have a recommended source for Clematis recta ‘Lime Close’? Oh yes, plenty of deer here, but there are way too many plants outside the fence to protect, so they’re on their own. Increasing numbers of rabbits inside the fence, though, so I thank you for the recommendation! If you can find ‘Axminster Gold’ comfrey, I’d definitely recommend giving it a try. Thanks for the source. I just shovel-pruned a Carolina jasmine that was once fine, but since the willow and hollies matured, it wanted to take over everything vertical! It was also self-sowing too much for me. So, now I’m searching for something to go beside a stone column corner inside the cottage garden. Something that doesn’t climb is appealing right now! 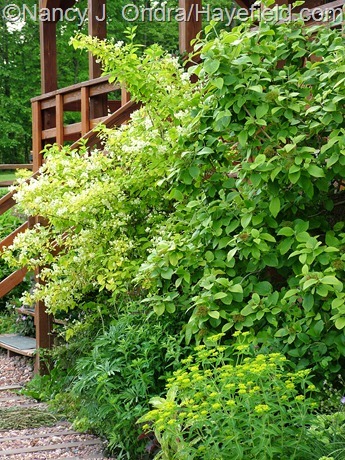 Sounds like a selection of Clematis recta might be ideal for that spot. Mine gets up to about 5 feet, weaving up through taller companions. Inspiring! Everything looks picture-perfect in your gardens Nan! Thanks, Christine! I hope your fall garden is going well too. Just lovely. 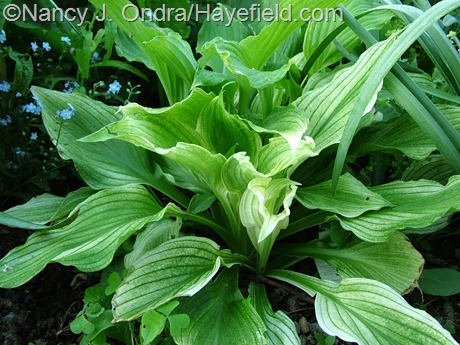 Thanks for including Hosta ‘Mostly Ghostly’ when it is off-peak. Went from ‘showstopper’ to ‘serious spider mite infestation’ ! At least in my opinion. Thanks for sharing! Yep, you’ve nailed the summer effect of ‘Mostly Ghostly’, Tim. The plant’s not too big, though, so it’s easy to ignore, and I still treasure it for the spring effect. You’ve got it, Vicki; it really is a lot of work to keep up with all this, especially this time of year. That’s what makes fall gardening so much more pleasant: once the main planting and weeding work is done, then things relax and I can actually enjoy the garden. If it weren’t for Bloom Day, I’d probably not even notice all the prettiness going on right now. Thanks for visiting! I have decided I have too few columbines, the hard part will be choosing which to add, but you have some intiguing options, thanks for the tour, as always it is so lovely! That’s the great thing about growing a seed mix like ‘Touchwood Supreme’, Cheryl: you get lots of seedlings, and they’re all different and wonderful. 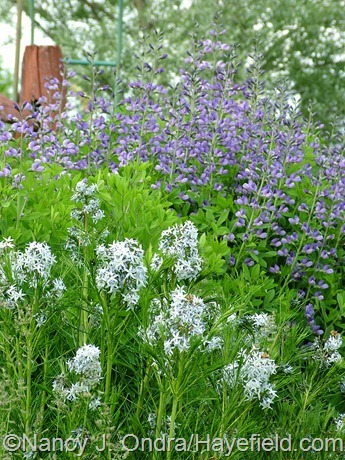 I love your row of baptisias and amsonia… they go well together and remind me I would like to grow more of them. Mine all bloomed about 3 weeks ago. Carolina moonlight gets more gorgeous each year I think. 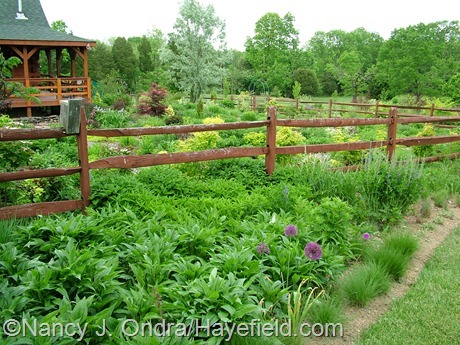 It is great to see all the energy that has been pent up all winter springing forth in your garden, but I know what you feel like trying to keep up with all the garden chores. Mine has just settled into the summer mode and stopped growing so rapidly so I have a bit of a breather. It is lovely to look at your garden as always. BTW, I planted out the red plantain and some of the golden campion that grew from your seeds this past week… Its exciting to see things come up like that! I’ll send you a photo of them as they progress. right now they are tiny sprouts! I look forward to things slowing down a bit, Kate. Thanks for reporting back on the seedlings. I too have been enjoying the seeds that some readers sent me as part of my seed-sharing project last fall. Unfortunately, I misplaced the notes of who sent what, so I’ve ended up thanking several people for the wrong seeds – how embarrassing! 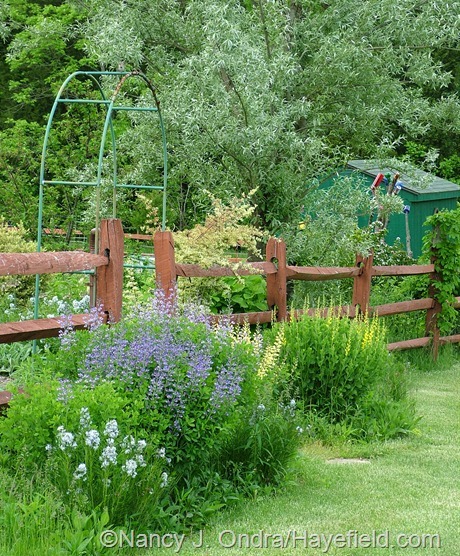 Thank you for sharing your garden with us! Always a joy to see such beautiful combinations. Love love it all! Thanks, Joni. I’m so glad you came by to visit. Welcome to Hayefield, Noel; so kind of you to visit! When I saw your starter photo, I had to smile – I purchased some rescue baptisa from a garden center back in March, and thankfully they still (kind of…) had their lables on them. One was called “Carol— M— and the other “Blue”. So now I think I’ve properly identified them! hee hee! They’re planted in a similar fashion to yours, and even though there is only three flowering spikes each, I hope to one day have the amazing clump that you have! Gorgeous! 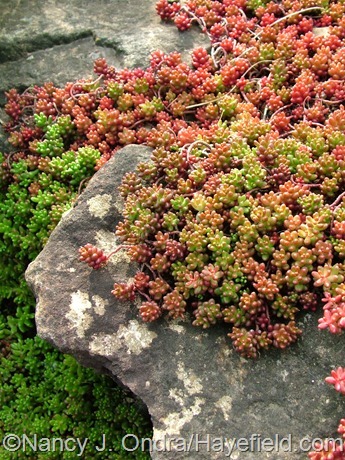 I do have a question concerning Heuchera, if you do not mind? Do you notice if they grow better in sun, or shade? ? I have a 3rd year “Southern Comfort” and “Midnight Burgundy” that I’m concerned about – they’re not really getting bigger… or fuller I should say. Yours are so lush! But it looks like they are in sun… but I always thought they were better in the shade! In other news; your seeds I got from last fall were wintersown in containers, and I’m happy to report that the cotton has grown great! Hey, that’s great about the baptisias. It’s nice to know their names, though they’re lovely no matter what. The clumps I showed today are about 6 years old, I think. I usually cut them back by half once they’re done blooming to keep them from sprawling on their companions too much. 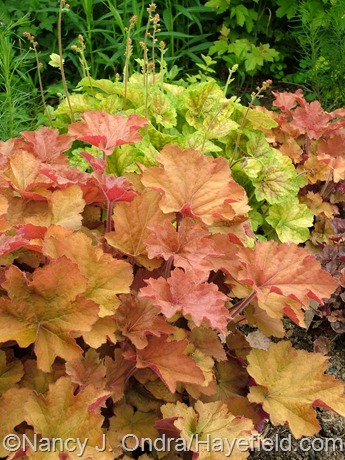 I have my heucheras in a spot that gets sun most of the day right now, and until about 4 pm in summer. 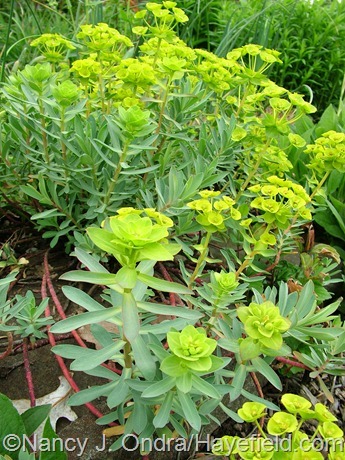 It’s pretty dry there too, usually, because they’re planted at the base of a row of viburnums. I’ve tried a lot of different ones in this area over the years. ‘Obsidian’ is the only dark-leaved one I’ve had last for more than 3 years. I’ve been having very good luck with the H. villosa selections, such as ‘Southern Comfort’ and ‘Caramel’. They get lots of alpaca manure, too. I’m happy to hear that the cotton is doing well for you. It’s disappointing to hear that the others didn’t sprout yet, though; if they’ve been outside since late November, I’d have expected them to sprout by now. If they don’t grow, we can try again this fall. @ Nan: Oh, I made sure to save a couple of each seed! 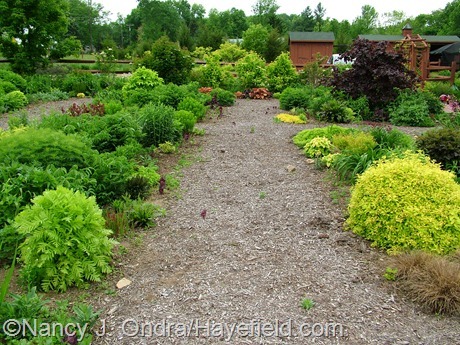 … I will try direct sowing some of them in the fall to replicate their natural growing habits. Yes, that would be a MUCH less troublesome solution, Donna! What a lovely bloom day post! I love the ‘Isla Gold’ tansy and the Serious Black clematis. Wishlist keeps getting longer! From the seeds you sent, the amsonia seeds, as well as the widow’s tears, have sprouted and been transplanted to their places in the new back garden. I’m not sure what to expect from them as we only have another month or so of “nice” weather before it will be seriously hot and dry. Thankfully, I have them situated in a place where they will be shaded from the most intense afternoon and evening sun. That’s terrific news, Katie. I hope the seedlings settle in quickly and do really well for you this summer. Wow. What a fabulous tour. 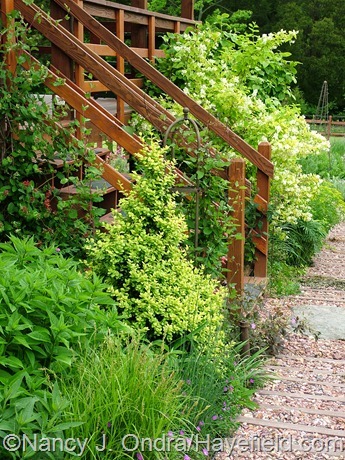 Your garden is so inspiring! Thanks so much! Happy Bloom Day! You are my mentor. I derive my wish list from your posts. I live in western Pa and you are weeks ahead of our blooms. In my mind I always thought a wayfaring tree was our common witchazel tree. Thanks for knowledge. I gravitate to your yellow leaved plants. 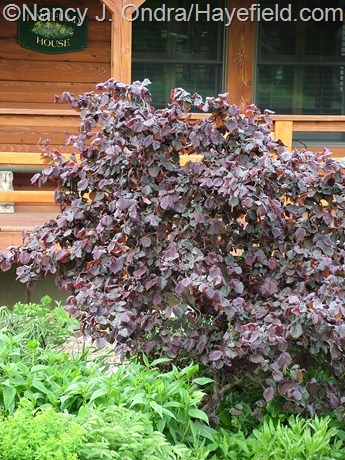 Have you ever planted the smokebush, Gold Spirit? Mine dies back every winter, including this winter. My other smokebushes do fine. You’re so kind, Greg. 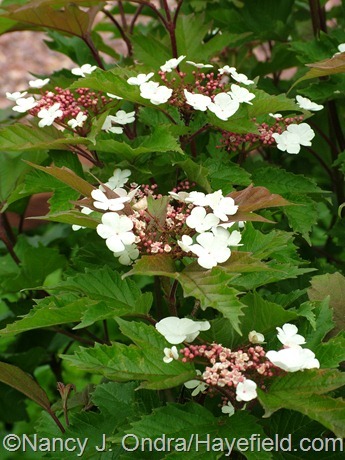 “Wayfaring tree” is the common name I know for Viburnum lantana, but, like other common names, it probably is used for other plants as well, so I imagine it could apply to witch hazel as well. I haven’t had much luck with ‘Golden Spirit’ either. I’ve killed two so far but am trying one more time, because the foliage is sooo handsome. The one I planted last year looked terrific this spring but then got frosted, and it’s not producing much new growth. I think I am not meant to have it. Or, maybe I could grow it as a VERY expensive annual…. 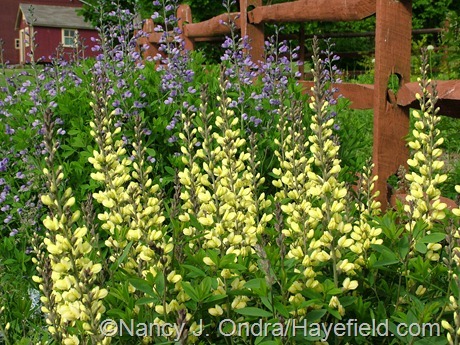 I have only one baptisia, Purple Smoke but I love the yellow and will look for one to add to my garden. I was also glad to read that you cut yours back after they bloom. I had just decided that I did not give the one I had nearly enough room. The hard trim works very well for me, Sue Ellen. 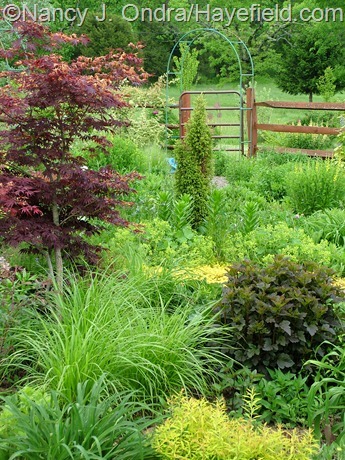 When the clumps have just a few stems at planting time, it’s hard to leave them all the space they’d need to spread out fully as they get older. There are some truly masterful combinations here! S. ‘Ray’s Golden Campion’ looks like it could be a useful punch of color in many situations, and Anthriscus sylvestris ‘Ravenswing’ is new to me. 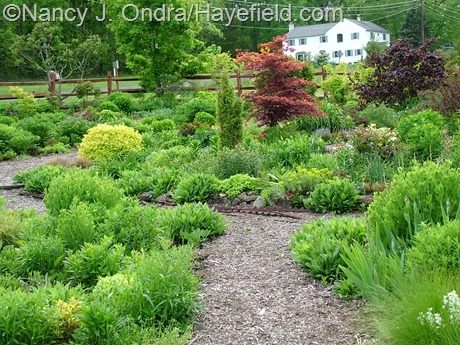 ps- I was out to visit Carolyn at her garden a few weeks ago & hear that I just missed meeting you. Perhaps another time! Hi there, Julie. Sorry I missed you! It looked like you all had a wonderful visit, though. First rate as always Nan..here in zone 9 Northern California, I barely have open flowers on the Ladys Mantle, and no buds to be seen yet on Ravenswing. 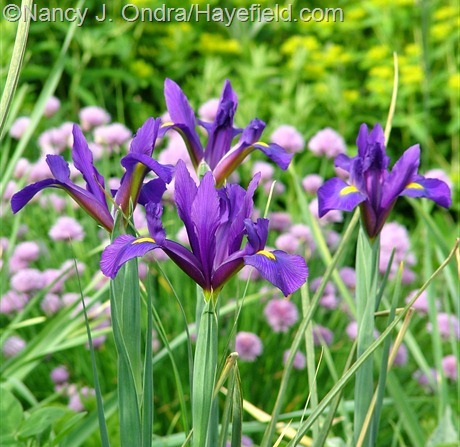 I find that my blooms this year are far closer than usual to those of my friends in New England.My Iris are done though! Wow, ks, you’re having an especially weird spring, aren’t you? I always admire people who can come up with great combinations for this time of year, since the weather makes bloom times so unpredictable. Everything looks absolutely beautiful. 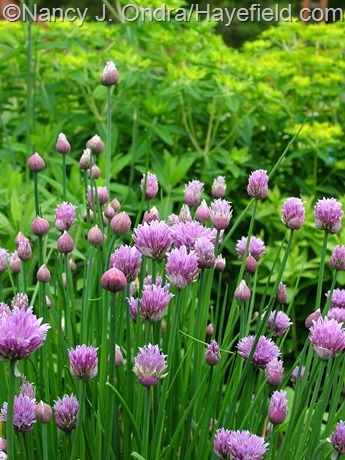 Even your “common” chives are uncommonly lovely! Thanks, HB. (Almost) everything looks nice against chartreuse, I think. Hi Carolyn! You know, it’s been so long since I’ve seen ‘Max Frei’ in person that I can’t remember exactly how it compares color-wise to ‘New Hampshire Purple’. Now you’ve piqued my curiosity, I’ll have to bring some ‘Max’ home to see…. Always a treat to have you stop by, Scott. I’m thinking that we need an interim Bloom Day this time of year, because there’s so much going on in the garden! Nan, your GBBD posts are always a feast for the eyes. Most of all, you’ve taught us to truly enjoy the beauty in foliage and we have tried to live that lesson here as well. Happy Spring! Happy spring to you and Steve too, Cathy! I hope you have a glorious rose display this year. Welcome, Becky! 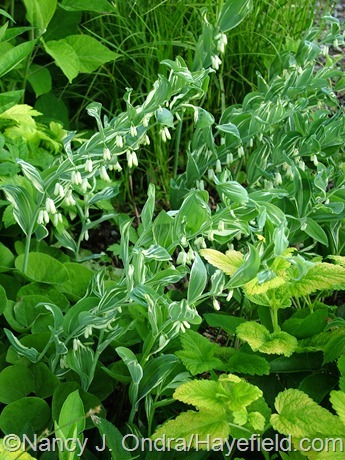 S. x uplandicum ‘Axminster Gold’ has been very well behaved for me; in fact, I kind of wish it would be more vigorous. 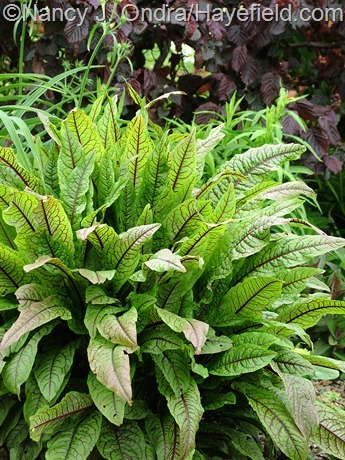 If you’re looking for a comfrey with solid yellow leaves, you could search for ‘Belsay Gold’. It’s a selection of Symphytum officinale. This one does seed around a fair bit, even though I try to keep it deadheaded.